Vivekananda Kendra Nagpur Branch celebrated Gurupaurnima utsav from 7th to 9th July 2017. A three days series of lectures was arranged on this occasion at Kendra karyalaya . On the opening day of the series, the retired professor of Dharampeth College Ms Ushatai Gadkari was invited. She said, “Our first Guru is Mother, after her every member of our family, then our Teacher in School is our Guru. Not only this, every living or non-living thing which is the part of this universe, is our Guru, because everyone of them teaches us something. Self-conversation is necessary to determine Gur-Tatwa. The Introduction of the program was given by Manjiritai Dhavle and the Speaker was introduced by Gitatai Kelkar. 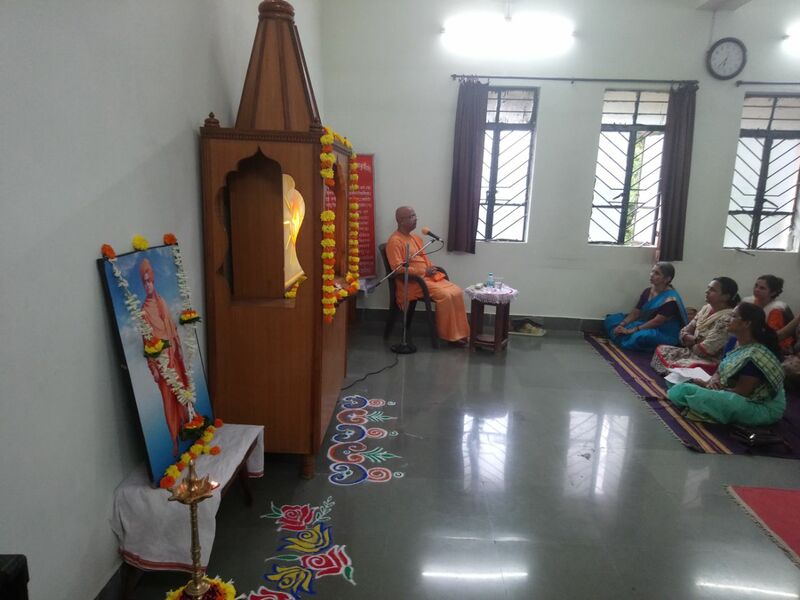 Shradhey Jyotiswaroopananda Maharaj of Ramkrishna Math, Dhantoli was the invitee on Second day. “The first word in the World is Omkar and Omkar itself is the World. It is not only a word but it is ‘NAADBRAMH’. GU means Darkness and RU means Light. In that way GURU represents a person who guides us in the way from Darkness to Light.” He interpreted ‘OMKAR’ in very simple and interesting way. Asavaritai Kulkarni introduced the speaker. Prof. Raghunath Bhalerao, who was the invitee on the third and concluding day, explained the ‘Importance of Guru in the present scenario’. He elaborated the subject especially for the youth, which was prominent part of the audience, by quoting historical and current examples. Dipalitai Agrawal introduced him to the audience. Chanting of Guru-Bhajan on all the three days of the Lecture Series made the Whole atmosphere holy and sacred. On the concluding day, Flowers were offered to Omkar. On all the three days, the program was conducted successfully by Renutai Indurkar. Total 140 people attended the program.